Rig this roadster to an automatic reel that permits continuous rotary action. 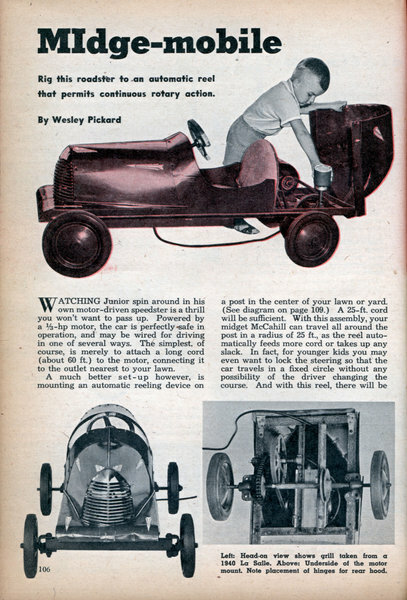 By Wesley Pickard WATCHING Junior spin around in his own motor-driven speedster is a thrill you won't want to pass up. 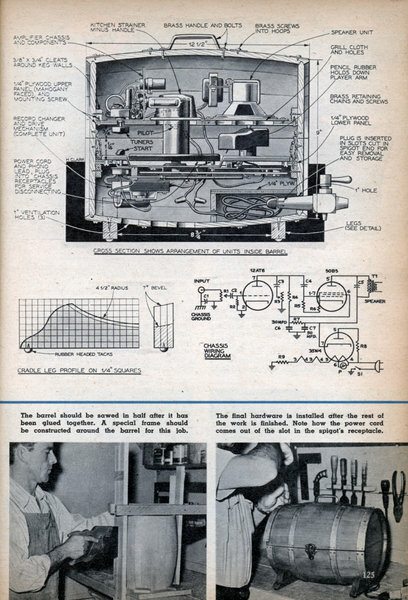 Powered by a 1/3-hp motor, the car is perfectly-safe in operation, and may be wired for driving in one of several ways. The simplest, of course, is merely to attach a long cord (about 60 ft.) to the motor, connecting it to the outlet nearest to your lawn. The recreation room in your home will be enhanced by this out of the ordinary, record changer cabinet. By Loren Collins THIS is an unusual project requiring a minimum of material and only the simplest hand tools. 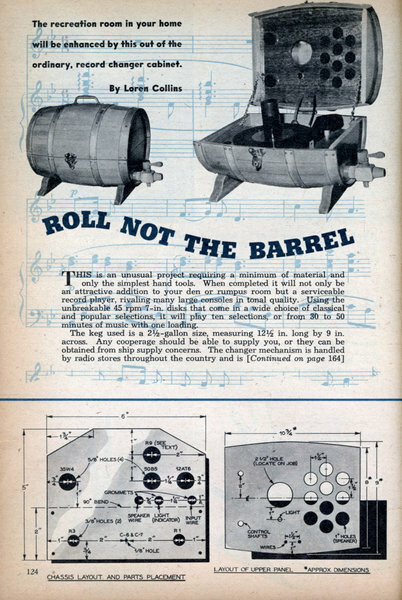 When completed it will not only be an attractive addition to your den or rumpus room but a serviceable record player, rivaling many large consoles in tonal quality. 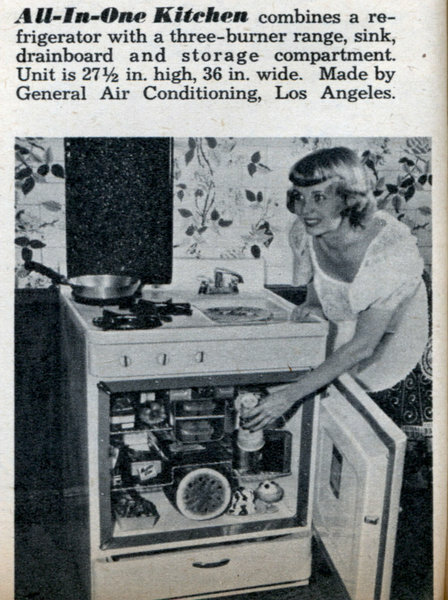 Using the unbreakable 45 rpm 7-in. disks that come in a wide choice of classical and popular selections, it will play ten selections, or from 30 to 50 minutes of music with one loading. 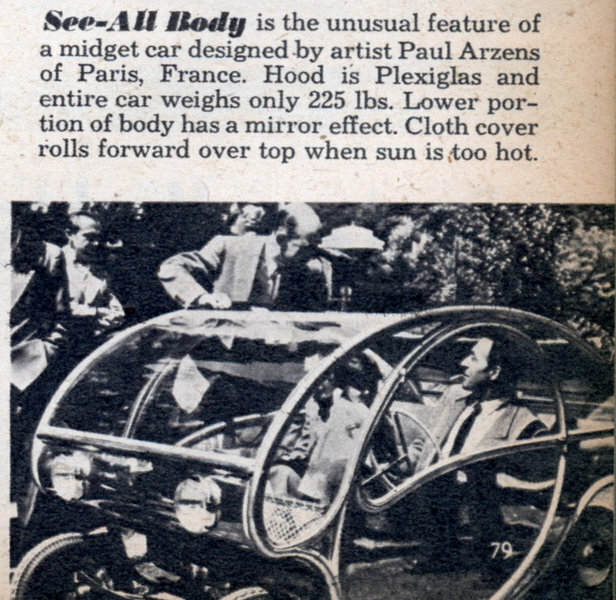 See-All Body is the unusual feature of a midget car designed by artist Paul Arzens of Paris, France. Hood is Plexiglas and entire car weighs only 225 lbs. Lower portion of body has a mirror effect. Cloth cover rolls forward over top when sun is too hot. Make as much as $5 for one hour's work Yes, I'll send this book to you free. It tells all about one of the most astonishing discoveries of recent years. 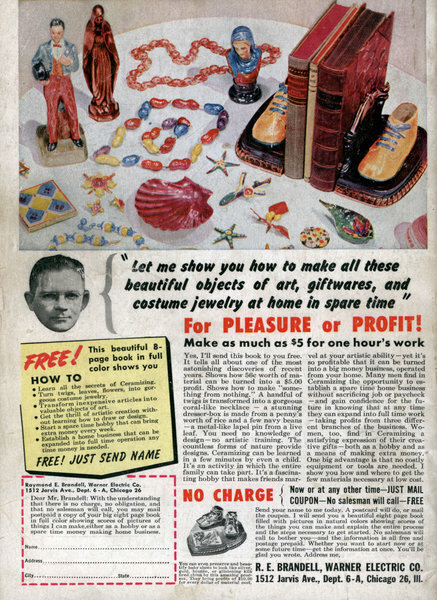 Shows how 56c worth of material can be turned into a $5.00 profit. Shows how to make "something from nothing." A handful of twigs is transformed into a gorgeous coral-like necklace â€” a stunning dresser-box is made from a penny's worth of rice and a few navy beans â€” a metal-like lapel pin from a live leaf. 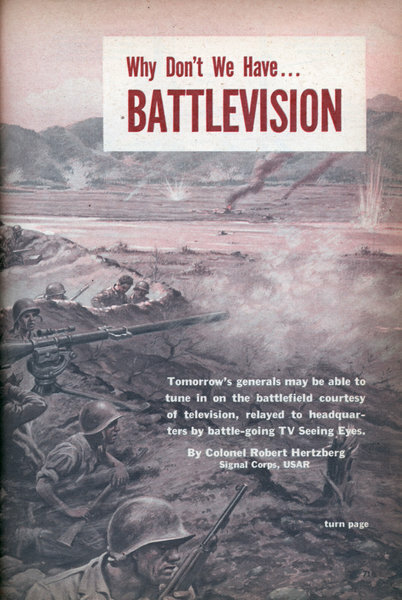 Tomorrow's generals may be able to tune in on the battlefield courtesy of television, relayed to headquarters by battle-going TV Seeing Eyes. 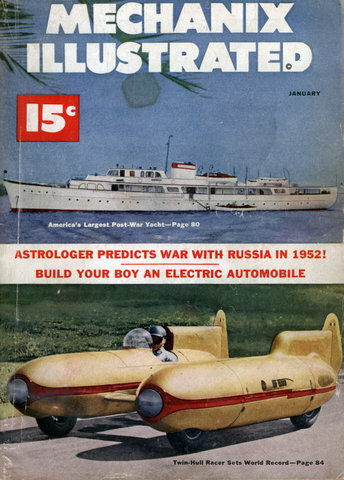 By Colonel Robert Hertzberg Signal Corps, USAR THIS is no fantastic rambling of science-fiction! 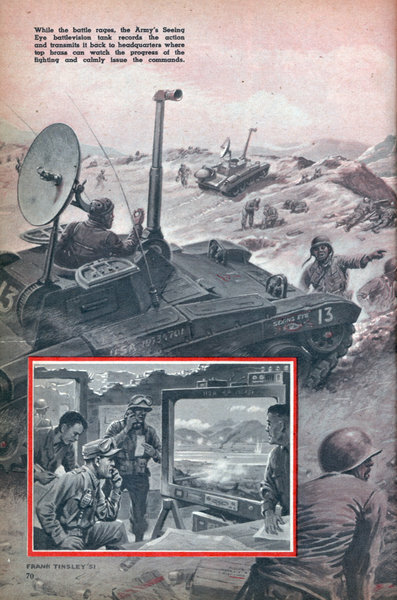 If there is another war, it will provide definite opportunities for the use of modern television miracles. TV set owners now enjoy better views of athletic contests than do most people right on the scene. Powerful telephoto lenses reach across playing fields and give spectacular close-ups of a runner dashing for the goal line or of a fielder snatching a high fly. Wide-angle lenses broaden the view and produce panoramic effects of great sweep. 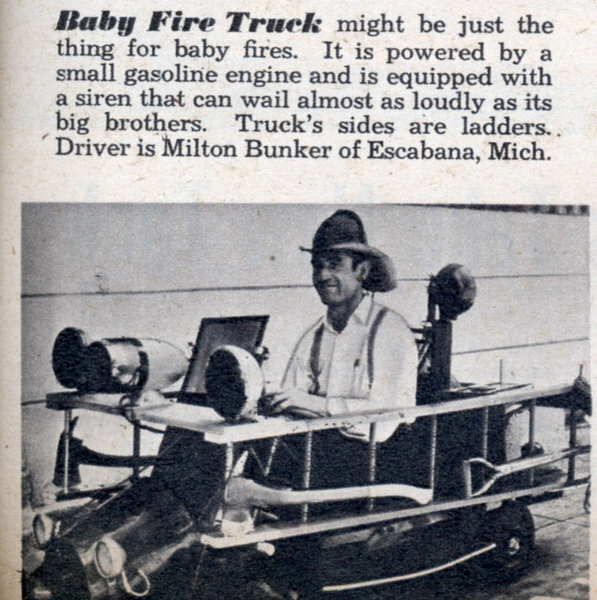 Baby Fire Truck might be just the thing for baby fires. 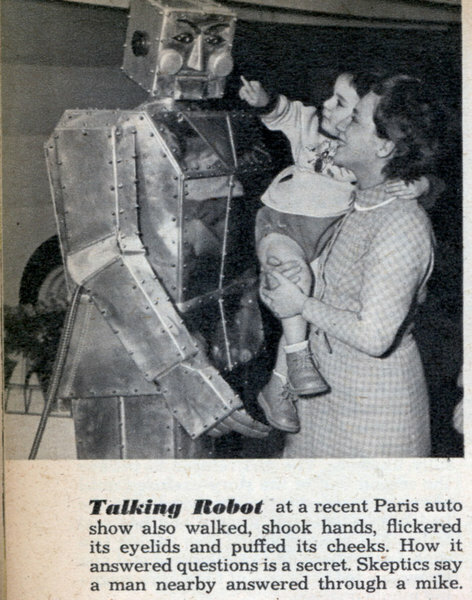 It is powered by a small gasoline engine and is equipped with a siren that can wail almost as loudly as its big brothers. Truck’s sides are ladders,. 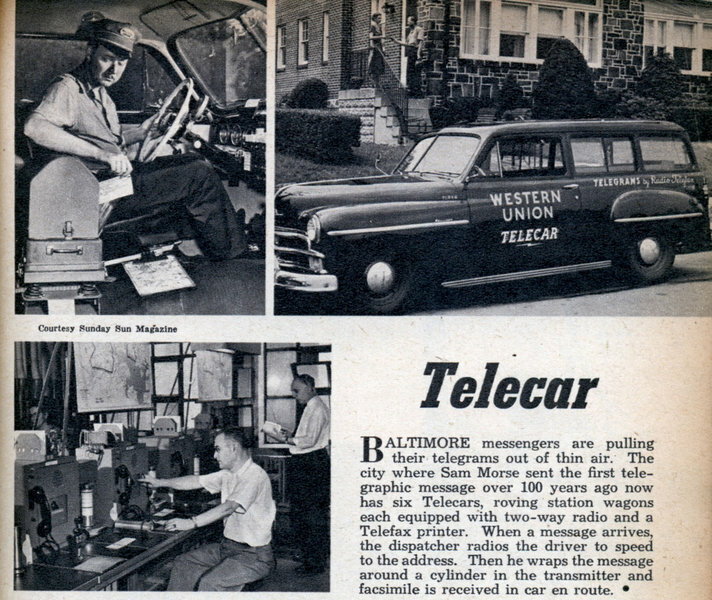 Driver is Milton Bunker of Escabana, Mich. Call astrology a science or just plain hocus-pocus, millions of people not only believe in it but actually live by it. 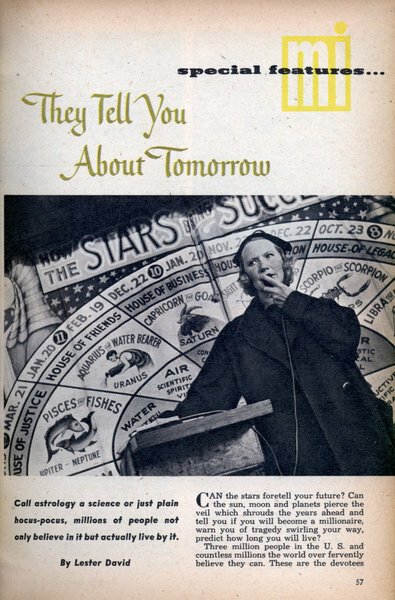 By Lester David CAN the stars foretell your future? Can the sun, moon and planets pierce the veil which shrouds the years ahead and tell you if you will become a millionaire, warn you of tragedy swirling your way, predict how long you will live? Three million people in the U. S. and countless millions the world over fervently believe they can. These are the devotees of astrology. 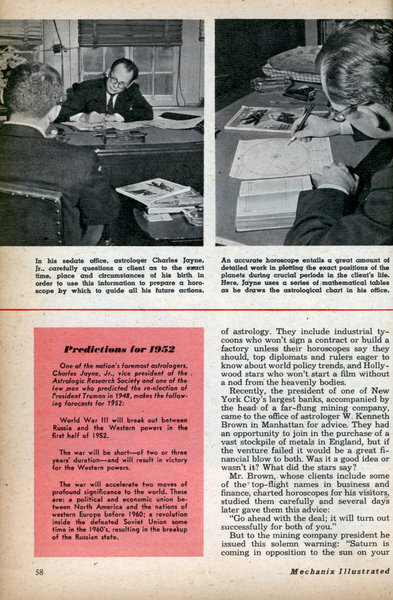 They include industrial tycoons who won't sign a contract or build a factory unless their horoscopes say they should, top diplomats and rulers eager to know about world policy trends, and Hollywood stars who won't start a film without a nod from the heavenly bodies. Recently, the president of one of New York City's largest banks, accompanied by the head of a far-flung mining company, came to the office of astrologer W. Kenneth Brown in Manhattan for advice. They had an opportunity to join in the purchase of a vast stockpile of metals in England, but if the venture failed it would be a great financial blow to both. Was it a good idea or wasn't it? What did the stars say? If you're worried about man's powers of survival read about these miraculous escapesâ€”and relax. By I. B. Neer SWIRLS of dust momentarily blinded Charles W. Arter, a brawny pitboy, as he trudged along a mine field in South Yorkshire, England. Two miners behind him shouted a warning, but it came too lateâ€”Arter's foot went over the brink of a shaft. He clawed desperately at the air as he went down, his screams floating hollowly from the yawning, black pit. It was certain deathâ€”the shaft was 1,554 feet deep and no man can survive such a drop. But, halfway down, Arter overtook an elevator cage which was making a swift descent with a load of miners. He landed gently on the roof, rode easily the rest of the way down and walked away completely unharmed as the astounded men stared speechlessly! 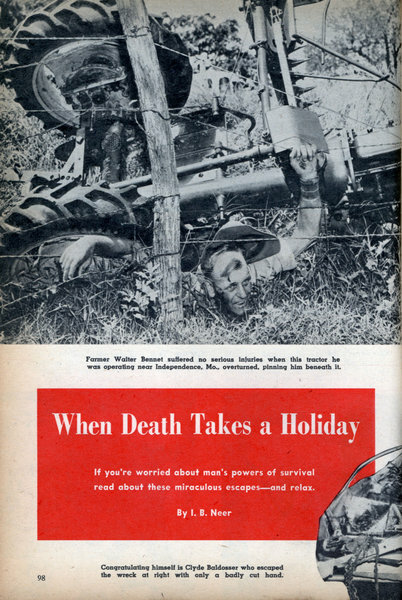 Death takes a holiday like that more frequently than you think. 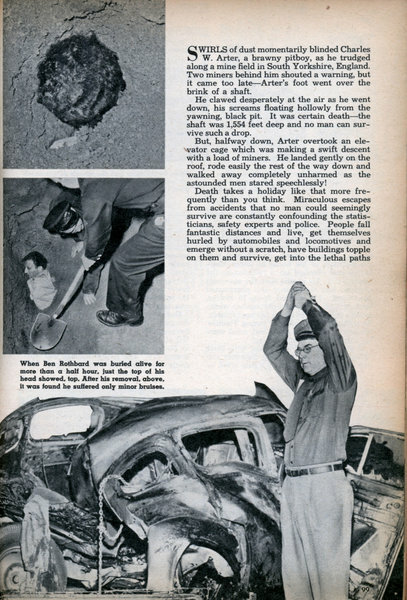 Miraculous escapes from accidents that no man could seemingly survive are constantly confounding the statisticians, safety experts and police. People fall fantastic distances and live, get themselves hurled by automobiles and locomotives and emerge without a scratch, have buildings topple on them and survive, get into the lethal paths of hand grenades, bullets and flying spears and walk away unharmed. 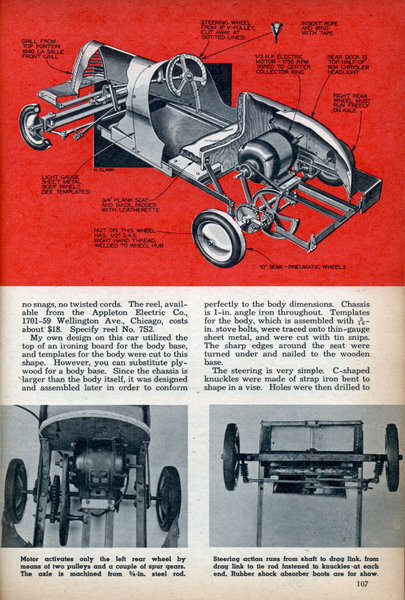 Dog cart built with individual coil spring suspension and 20-in. bicycle wheels yields a soft ride. 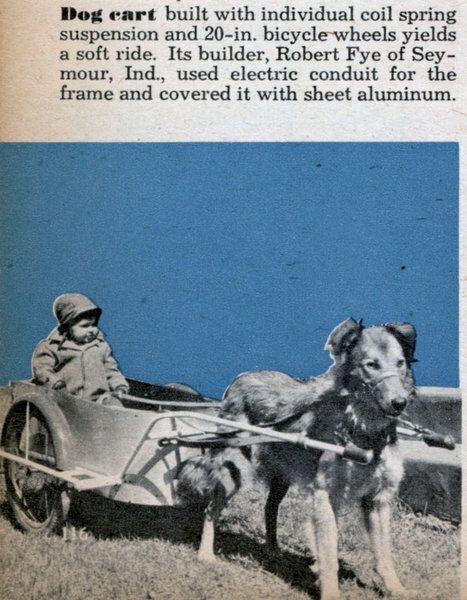 Its builder, Robert Fye of Seymour, Ind., used electric conduit for the frame and covered it with sheet aluminum. By Michael Stern Mi's European Correspondent AN amazing contraption, I thought, as the odd-looking car was unloaded from a truck onto the Appian Way, just south of Rome. 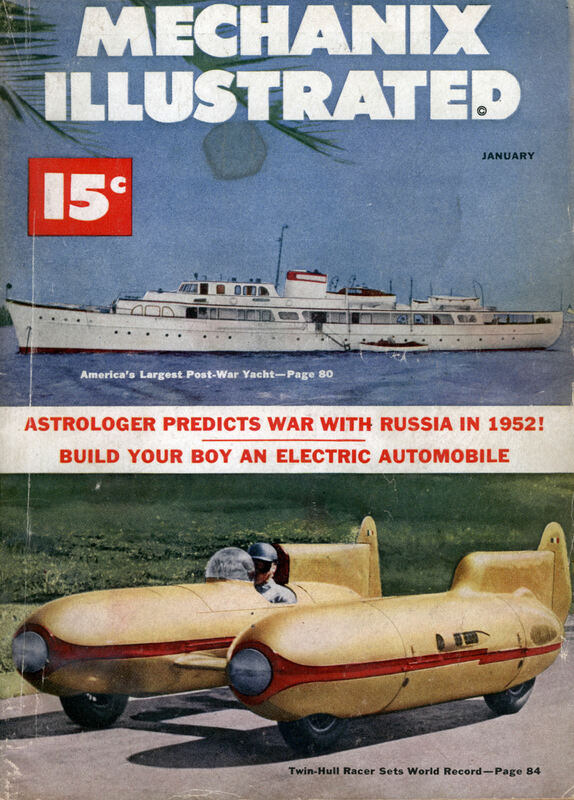 The kind of vehicle that springs full-grown out of fantastic comic books. 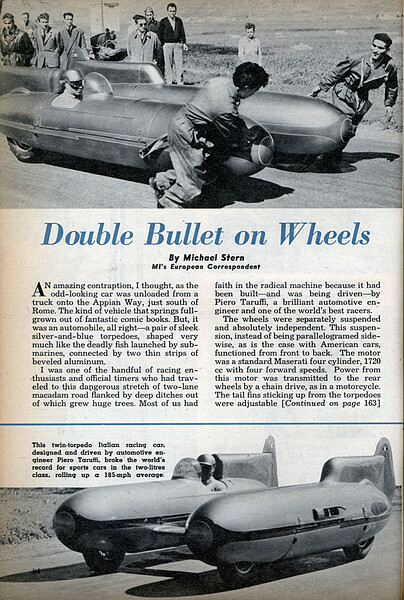 But, it was an automobile, all rightâ€”a pair of sleek silver-and-blue torpedoes, shaped very much like the deadly fish launched by submarines, connected by two thin strips of beveled aluminum.